October 13, 2014 | 1:30 p.m.
Bethel University broke ground on a new 22,500-square-foot Wellness Center on October 8 as hundreds of students, student athletes, staff, faculty, donors, alumni, Board of Trustee members, friends, and vendors associated with the project gathered to celebrate the occasion. Current fitness facilities are limited and used primarily by athletic teams, but with state-of-the-art fitness equipment available for all students to use, plus expanded resources for student athletes, the Wellness Center will serve the entire community with one convenient, easily accessible location. The Wellness Center will also include approximately 5,500 square feet of assessment spaces, labs, and creative learning spaces for biokinetics, one of Bethel’s fastest-growing undergraduate programs, which has rapidly outgrown its space. Seth Paradis, professor of biokinetics, told the crowd how excited the biokinetics students are to work in a facility with many opportunities to learn. 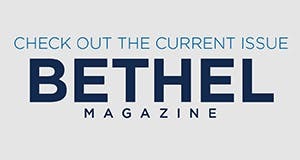 He emphasized that the facility will benefit not only the internal Bethel community, but will increase opportunities to bring others to campus through partnerships with community organizations. 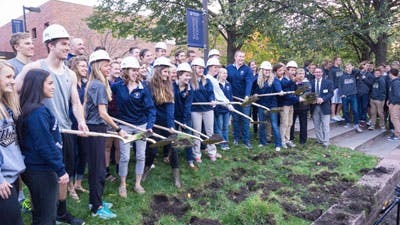 The gathering in Brushaber Commons was followed by a groundbreaking in Kresge Courtyard, where several groups of community members wearing hard hats dug into the ground with ceremonial, gold-colored shovels. Because of the additional classroom space at Pine Tree, the recently acquired building in Arden Hills, the Wellness Center project was scaled down from an original, two-phase plan. The re-design places the building in the same location—the north side of the Robertson Center and the Hagstrom Center—but will be three levels instead of four. The fitness center will occupy two levels and the biokinetics program will be housed in the top level. The entire project is estimated to cost $11 million—less than phase 1 of the previous plan. Nearly all of those funds have already been raised. Construction is expected to start in November and be completed in fall 2015.